Hi all. I am a new member of this forum and very new to English Fords. I just picked up a 1959 100e and this is the first Ford I have ever own. I am excited to get sucked into these little cars as I have always liked them but I didn't have the opportunity to acquire one until now. You will have to pardon my ignorance as I know very little about English Fords, but I am looking forward to gaining some much needed knowledge on the subject. Here is a photo of the car, it was originally a southern states car as as such has very minimal rust (luckily) and what I believe are the original 63000 miles. Welcome to the forum. Nice find. You'll find here quite a few people that are knowledgeable on the 100E series. Car seems to look original. Ermine white ? Most parts are still available in this Country. Thank you, that's good to know that there is a knowledge and parts base in the US. I am not sure what color it is, I was looking at some color chips and Ermine white is certainly a good guess. I know the car was repainted once in the 1970s, thankfully in the original color. Welcome. Sweet little car you have there. Sorry to be a pain, but you spelled freude wrong, unless I am missing some hidden meaning. PS I was about to say I've yet to own one but then I remembered I had a 107E for about a month back in the day. The car looks great in the photo, you must be very happy with it. 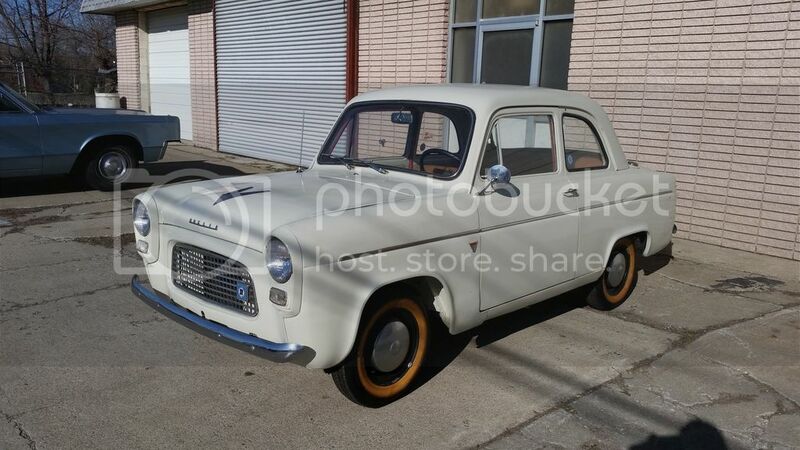 To maximize your 100e experience you should really join in on the fun at the Ford 100e Forum http://www.ford100e.org/ it is free to join and very worthwhile. I am very happy, it was a lucky find for sure . And, I just signed up for ford100e.org, thanks for the tip. Good decision, I was just there as saw your post. It is the best place for 100e info and support. Welcome Kyle, cool looking car. Car looks really nice. And welcome to the forum. Brent, I see that you are in Novato, I am originally from Marin county. Glad to see another Detroit person on the list!